In this edition of Muscle Car Milestones, we’ll turn back the clock and check out the 1965-1966 Shelby GT350. Like a pseudoscientist from the Dark Ages, Carroll Shelby worked his black magic on a Ford Mustang GT fastback and transformed it into something even more nimble and sinister. In its day, the Shelby GT350 was a car that had no true equal. There was no Camaro or Firebird for Shelby’s creation to instill fear. It was a standout back then and it’s still a legend today. The Shelby GT350 starts life as a Mustang GT fastback and then it’s transported to Shelby American for metamorphosis. You could get the GT350 in any color you wanted as long as it was Wimbledon White with blue rocker panel striping. Dual blue stripes were also applied across the hood, top, and trunk. The stock hood is also replaced with a fiberglass hood with a functional scoop. Where the rubber meets the road, drivers got 15-inch wheels with Goodyear 130 mph Blue Dot tires. Open the hood and you’ll discover a work of mechanical artistry. The GT350 is powered by a Cobra hi-riser 289 cubic-inch V8 churning out 306 horsepower and 329 foot-pounds of torque. V8. This engine starts life as a stock K-Code from Ford and is then “Shelby-tized” by adding a Holley four-barrel carburetor, aluminum high-rise manifold, and steel tube exhaust headers. Exhaust is routed through tailpipes that exit in front of the rear wheels. This engine is mated exclusively to a Borg-Warner four-speed manual transmission. 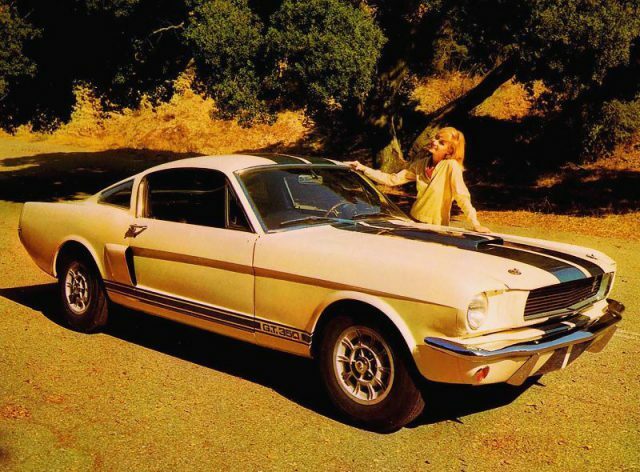 Motor Trend took a liking to the Shelby GT350 in their May 1965 issue. They complimented its handling abilities over the stock Mustang GT claiming that at near maximum cornering conditions, the blue dot tires grip well and don’t roll under as badly as stock tires. They also admired the car’s braking ability, stating they could hardly be better and bring the car to a stop in a short amount of distance without any wheel lock. With that in mind, they were able to push the GT350 from 0 to 60 in 7 seconds and sprint the quarter mile in 15.7 seconds running 90 mph. Enthusiasts that wanted more performance over that of the “regular” GT350 got their wish with the GT350R. These were designed for competition in SCCA B-Production racing and came equipped with modifications such as plexiglas side windows with aluminum frames, roll bar, and fiberglass front apron. Engine modifications included tri-y headers, modified heads, and engine oil cooler. These modifications, along with others, helped boost the engine’s power up to 350 horsepower. Only 36 of these specialized GT350Rs were ever built. 1966 ushered in several changes to the Shelby GT350. On the exterior, rear quarter panel windows replace the louvered windows from the previous model year. Rear brake air scoops were also added. The side exhaust pipes from 1965 were replaced with dual exhausts coming from the rear. Inside, changes include a fold-down rear seat and cowl-mounted tachometer. Drivers now had a choice between a four-speed manual or three-speed automatic transmission. A Paxton supercharger also made the options list this year. At $670, it was pricey and only 11 cars, including one prototype, were built with the supercharger. Shelby American boasted the 1966 Shelby GT350 was capable of running from 0 to 60 in 5.7 seconds. They also claimed it was the fastest American stock car on the road in 1966. With a car equipped with performance equipment such as a high-riser aluminum manifold, center pivot float four-barrel carburetor, and hand-built tubular exhaust system, that statement is easy to believe. Hertz Car Rental liked the GT350 so much they had Shelby build 1,000 of them for their rental car fleet. Dubbed the GT350H, it was common to find these racing at the local drag strip on the weekend and brought back needing repairs on Monday morning. The vast majority of GT350Hs were black with gold stripes but some cars were painted red, white, blue, or green. The GT350H was powered by the same 289 cubic-inch V8 found in the “regular” GT350 and could be equipped with a manual or automatic transmission. Car and Driver took this rent-a-racer for a spin in their May 1966 issue and racked up a 0 to 60 time of 6.6 seconds and ran the quarter mile in 15.2 seconds running 93 mph. Rumor has it the Shelby GT350 got its name in an unusual way. While conjuring up what to call the car, Carroll Shelby asked Phil Remington how far it was from the race shop to the production shop. Phil told him it was about 350 feet. Shelby then decided to call the car the GT350. No matter what name Shelby made up, the GT350 was a pint-sized racer that was ready to take on the Chevrolet Corvette in SCCA B-Production racing. It’s one of our favorite Mustangs and one we don’t get so see very often. It’s typically a car you hear coming long before you see it.